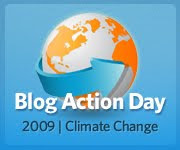 Have you registered for Blog Action Day 2009? Do you care about the environment? Have a blog? Would you consider joining thousands on a single day of action to share an important environmental message? Consider joining Blog Action Day! The official site says it better than I can, so here's their message: "Blog Action Day is an annual event that unites the world's bloggers in posting about the same issue on the same day on their own blogs with the aim of sparking discussion around an issue of global importance. Blog Action Day 2009 will be the largest-ever social change event on the web. One day. One issue. Thousands of voices." So what is everyone posting? No, they aren't asking everyone to post the same message on their blogs. No, we're not expected to be drones. Blog Action Day encourages you to post something that reflects the theme of your blog. You are encouraged to write about green tech, how climate change affects lifestyle/ health, how climate change impacts other social issues, eco-friendly or sustainable design, places to visit before they are affected by climate change, etc. So, ready to join in? Have something to say about climate change? Then why not register your blog or just search the official website to see if your favourite blog is listed. If you register, let me know by leaving a comment, so I can check out your post. And, don't forget to come back on October 15th to check out my Blog Action Day post!